Yes, there really is Wi-Fi inside that tiny little card. We think it's going to change the way people take, save and share photos. 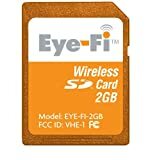 The Eye-Fi Card comes with everything needed to make it simple to set up and connect to your home Wi-Fi network. After that, pop the card into your digital camera and start capturing those memories. It's called the "Eye Fi " and essentially it turns any camera that takes SD cards into a "wi-fi" camera.